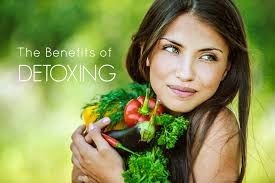 Detoxing your body is the best way to feel and look healthier, loose weight and have glowing skin and hair! A detox program can help the body's natural cleaning process by resting the organs through fasting, stimulating the liver to drive toxins from the body, promoting elimination through the intestines, kidneys and skin, improving circulation of the blood and refueling the body with healthy nutrients. Detoxing also helps your skin clear up, enhances skin tone and clarity, improves digestion, balances hormones and gives you more energy. The first thing you want to do is cut back on toxins. That means minimizing and eventually eliminating alcohol, coffee, cigarettes, refined sugars and saturated fats, all of which act as toxins in the body and are obstacles to your healing process. Also, it's a good idea to minimize chemical laden household cleaners and personal health care products like (cleansers, shampoos, deodorants and toothpaste), and substitute with safer, natural alternatives. "The body has its own natural healing system," says Peter Bennett, N.D., medical director of Helios Clinic in Victoria, B.C., and co-author with Stephen Barrie, N.D. and Sara Faye, of 7-Day Detox Miracle (Prima Health). "Detoxification enhances this system," he explains. Basically, detoxification means cleaning the blood. It does this mainly by removing impurities from the blood in the liver, where toxins are processed for elimination. The body also eliminates toxins through the kidneys, intestines, lungs, lymph and skin. However, when this system is compromised, impurities aren't properly filtered and every cell in the body is adversely affected. Here are some easy ways you can detoxify your body everyday. This helps flush out the toxins and alkalizes the body. You can also add a couple of teaspoons of apple cider vinegar to a glass of spring water. Hippocrates treated his patients with apple cider vinegar. He found it was a powerful cleansing and healing elixir, a naturally occurring antibiotic and antiseptic that fights germs and bacteria, for a healthier, stronger, and longer life. Don’t forget to drink plenty of water throughout the day to continue flushing out the toxins. Aim for 2 liters per day. Include greens such as kale, spinach and cilantro. These are nature's superfoods that pull the heavy metals and toxins out of your system so your body can begin to heal and reset itself. When this happens, all the healing of the body begins and weight loss is effortless. An easy juice drink is one cup of water, two cups romaine lettuce or kale, a pinch of cilantro, half a lemon, and three cups of fruit of your choice which can include an apple, , pear, banana or strawberries. Just add any fruit you like. Try the Glowing Green Smoothie by Kimberly Synder. Toxic oils can include vegetable oil, peanut oil, sunflower oil, cotton seed oil and canola oil. Substitute with good oils with healthy fats and omega 3s for brain function and health, such as extra-virgin olive oil, coconut oil, avocado oil, hemp oil and flaxseed oil. Also avoid substitutes that contain toxic artificial sweeteners, and opt for natural versions such as sweet leaf raw stevia, organic raw honey, raw organic coconut sugar, organic molasses, or organic maple syrup. White flour is like adding glue in the body, and it overworks the digestive system. It can cause digestive disorders, and it can make it difficult to have normal bowel movements. Keep in mind bread is a refined carbohydrate and converts to all sugar in the body. So even healthier breads should be eaten at a minimum. You can substitute white flour for other flours such as organic spelt flour, kamut flour, quinoa flour, brown rice flour, buckwheat flour or cornmeal. Switch from white bread to organic whole grain bread. Probiotics are more helpful then you may realize. They clear all the bad bacteria out of the cells and the body. Their little miracle workers because they leave the good bacteria and get rid of the bad. These bad bacteria can lead to a lifetime of health problems including weight gain, intestinal issues and the list goes on. Look for the purest form of probiotics which would be in a liquid or powder form. This is my favorite advice. Find the positive in every day and move your body. This will all help to reduce stress and the stress chemicals in your body. Walk or exercise as much as possible, hopefully everyday. Sometimes it's hard to get started but you'll feel better once you do. Grab a friend to walk or exercise with you or take the kids. Either way, get out there and do it. You'll be glad you did. For more on detoxification, check out best selling author Kimberly Snyder's "The Beauty Detox Solution".